Music in the MSX demo scene (and probably beyond the demo scene as well) really took off with the release of trackers, a concept quite different compared to the common 'tape editing' metaphor. 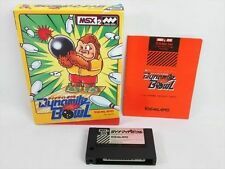 Of course, there have been other means of creating music on MSX, like MML and the graphically oriented Synthsaurus, but it's been the trackers that caused creating MSX music to take flight - most notably FAC Soundtracker and Moonblaster. There have been trackers on other platforms too; Amiga, Atari, C64, PC and others. Tracking is not a dated concept (trackers are still being made and updated today), although a slight underground/hacker image seems to persist around tracking. As a tracker user, you may find it troublesome to convince a classically trained musician to try a tracker, even when there's a fair chance that this person will actually understand the tracking method much quicker than you think. Convinced that tracking truly holds some potential, British coder Chris Nash spent a number of years working on a doctoral thesis while studying at Cambridge University. A tracker he created in an earlier research project now served as fundamental tool for his new research project. Also, for a limited period of time the userbase which this tracker already generated served as a source of information on how these people were using his tracker. This user interface, and how it influences creativity and flow in the composition process, was the key subject of this thesis; the Human-Computer Interaction. Long story short; in over 250 pages, Nash reports the findings of his research. The short edit-listening cycle, the keyboard interface, the fact you barely need a mouse, the hotkeys, they have all been researched empirically and are explained thoroughly. With this thesis, there is now scientific data in favour of tracking. Chapter six of the thesis features a certain Guinea MSX pig who volunteered as observable lab rat. The lab experiment being a new score for a Road Runner cartoon, the whole composing process was recorded on video and then studied by Nash. MSX gets mentioned multiple times in this chapter, not a bad thing, after all it is an academic article in 2012! 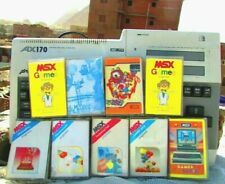 So, what's in it for MSX users? Well, for the moment the article is about research done with reViSiT, which is the actual tracker created by Nash. 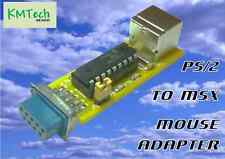 There's no immediate purpose for MSX users yet, but who knows what the future may bring. After all, Impulse Tracker (which reViSiT's user interface was based on) was used in Infinite's Montana John and the Templar's Treasure, Dr.Pill, Shift and Jailbreak. A possible future scenario could be one where reViSiT controls an MSX emulator running specific host software routing incoming MIDI signals to an instrument player. As reViSiT's file format is plain XML, it would be rather easy to convert the pattern data to a format an MSX can deal with. For the moment, the thesis is an interesting (although extremely detailed and academic) read for people who are interested in how the tracking interface influences creativity and flow in computer music. The curious PC composers among you could have a look at Chris Nash' website, and perhaps give reViSiT (VST, currently for Windows) a swing - you're not alone! 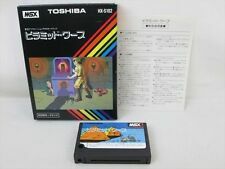 What's the interest of such news on a MSX website ? Maybe Wolf should start a new site dedicated to music creation instead of squatting MRC. Read the fifth paragraph. The feature set of this tracker is really close to becoming a cross development tool. Just a few things to add, and one could try to set up a construction with an emulator reacting to MIDI. A coder then makes a receiver tool which sends incoming signals to an instrument player, et voila: a new way to create music for MSX! Of all the thousands o' random applications made on/for other systems, this one might just become really interesting for MSX purposes. Probably one that isn't restricted to the functionality we had in the 90's. ..and then you may understand why I'm steering towards using reViSIT.. ^_^ But you know.. it may help when people download it, try it and *cough* try to convince Chris in adding just one or two more bits o' functionality.. then all we need is a way to hook it up to openMSX (tR-GT config), then we need some receiver to convert incoming MIDI signals to an instrument player. That's it I think. The nice bit is that when the sound emulation improves, the whole music creation process also improves. Essentially you'd be breaking up notes and instrument into two applications, each with their own team. The tracker development is steady, and the openMSX team is steady. It'd consider it a safe bet. I've been using reViSiT since 2006, the arrangement of Galaxy Hero Legend 2 was my first MSX related output. I'll guarantee you it's a potent tool! 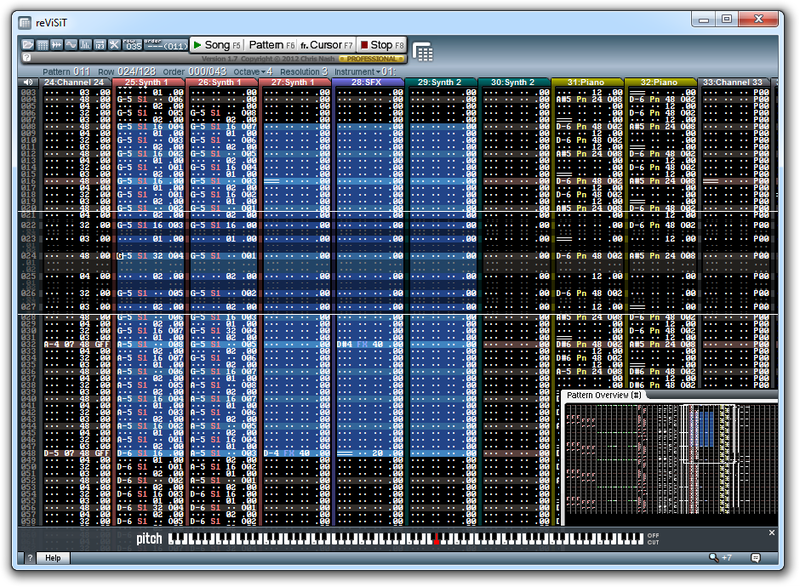 Just so you know: you have 64 channels to choose from, you can import midi files into this tracker, arpeggios are all supported, and I do recall plans to port reViSiT to other operating systems too. I didn't create this particular newspost for nothing, you know..
Hmm, So this newspost is just a 'I want this" post. reViSiT interface is based on Fast Tracker 2, like Milky Tracker. Impulse Tracker interface is very different. reViSiT's interface is based on Impulse Tracker, *not* on FastTracker. Or else I wouldn't be using it.. trust me; reViSIT is based on Impulse Tracker. That, and should I paste the thousands o' lines o' chatlog between me and the coder of reViSiT? I'm a beta tester, bughunter, frequent feature requester.. I'm telling you: reViSiT is based on Impulse Tracker. That's why I see opportunities for MSX people, because I'm close to the fire! Of course, compared to IT2, its interface has changed a bit (colors, scale, font), but that's merely the result of 'DOS vs today'. The hotkeys and navigation are quite identical. What's revits's file structure like? The proposal you make is great for creating and recording music. But how do you see (stand alone) playback on MSX? XML, quite vast. Being XML, a typical tune would be 20KB packed, and 700KB raw. Obviously, someone would have to make a player, but I don't think it's much of a bottleneck when the format is this clear - it's easy to convert it to your own format if you wish.